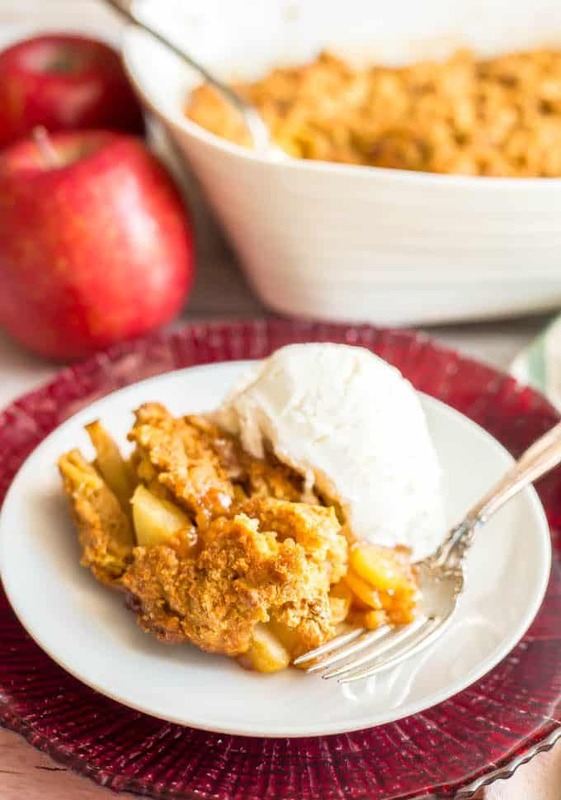 This healthy apple cobbler is full of apple and cinnamon flavors and goes perfectly with ice cream for a delicious dessert. 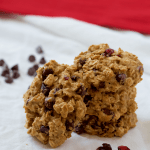 It’s (mostly) naturally sweetened and made with whole grains for a healthier sweet treat that will surely satisfy. We are finally to Thursday! Oh well, I’ve got a fun Charlotte food bloggers get together tonight and then tomorrow is Friday. We are really close, so let’s move it right along today! I legit eat an apple a day most days of the week. I love the crunch and natural sweetness of apples and they make such a great healthy snack. I also love cooking with apples and making apple-flavored desserts. 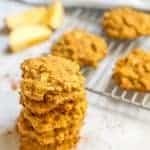 My whole wheat apple cinnamon breakfast cookies are a morning favorite in our house. 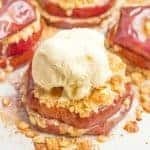 And each fall when apples are at their peak season, I look forward to making my easy healthy apple crisp stacks, which are a lightened up and much easier version of apple pie. My slow cooker apple butter with no sugar added is another seasonal must-have! 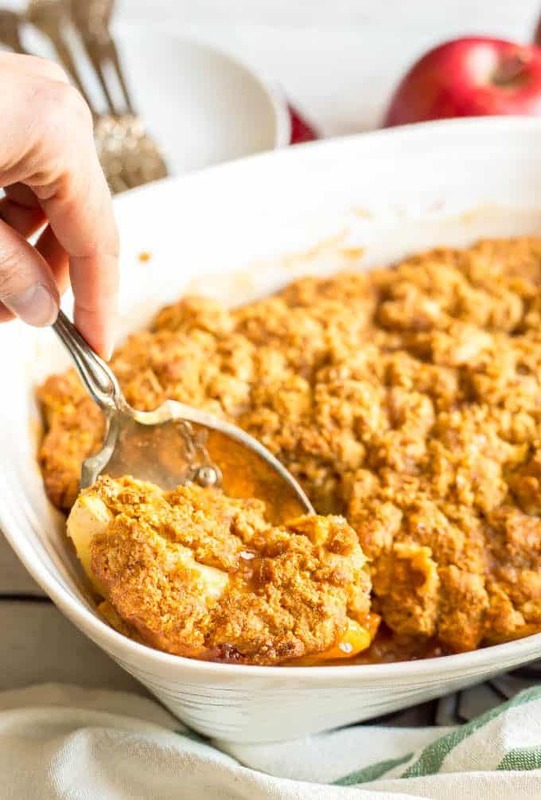 Today I’m sharing my healthy apple cobbler, which is a serious favorite in our house and also so easy to make. 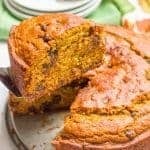 It’s a dessert with a fruit or savory filling that’s poured into a large baking dish and covered with a batter, often biscuit-like in texture. 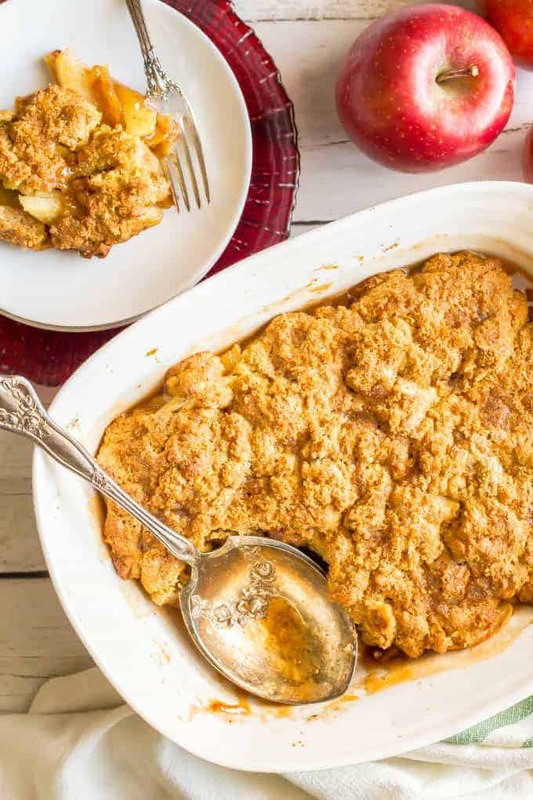 And this apple cobbler is lightened up but every bit as delicious! 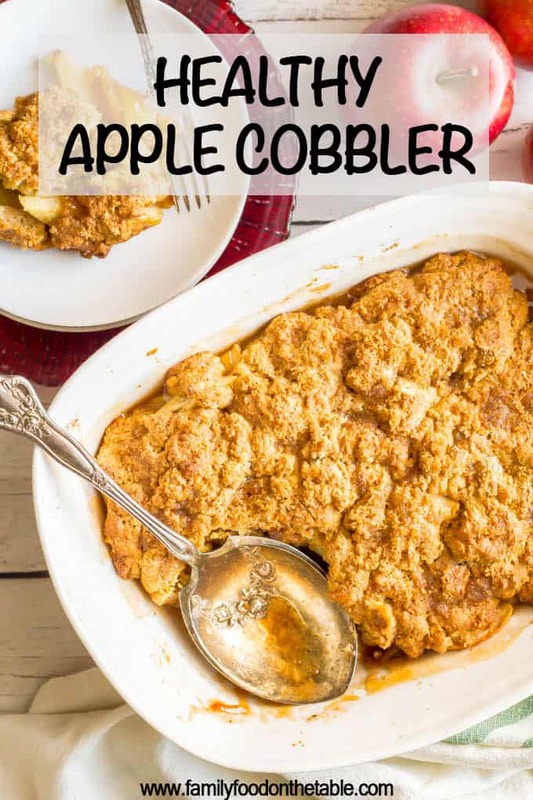 It’s super thick and gets a crunchy coating on top that pairs so well with the tender, soft apples. It’s also got an amazing biscuit like thickness. You’ll be going back for bite after bite. I generally use Fuji apples for apple cobbler. 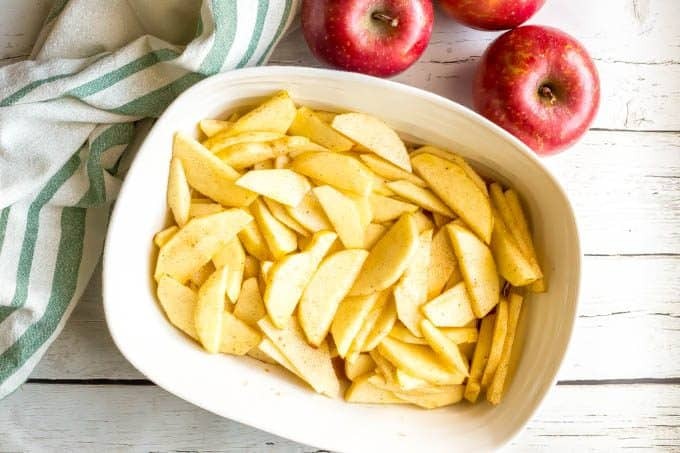 Other crisp baking apples can be used as well, such as Granny Smith or Honeycrisp or Golden Delicious. I use white whole wheat flour in my baking, but all-purpose flour or whole wheat flour would be fine here as well. As I mentioned, the biscuit-like topping is pretty thick. You’ll want to dollop it on and use your fingers to spread it out a bit. Don’t worry if the entire top isn’t perfectly covered. It’ll spread out to cover the fruit filling while it’s baking. Also, you really must add a dollop of vanilla ice cream for serving this cobbler. It’s kind of the perfect combination. Especially when you scoop some of the sauce from the bottom of the casserole to drizzle over top. Oh swoon! So next time you need a lighter dessert that’s warm and comforting, I hope you’ll give this one a try! P.S. 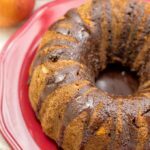 Check out my whole wheat pumpkin applesauce bread and my chocolate chip apple cake for other healthy apple favorites! 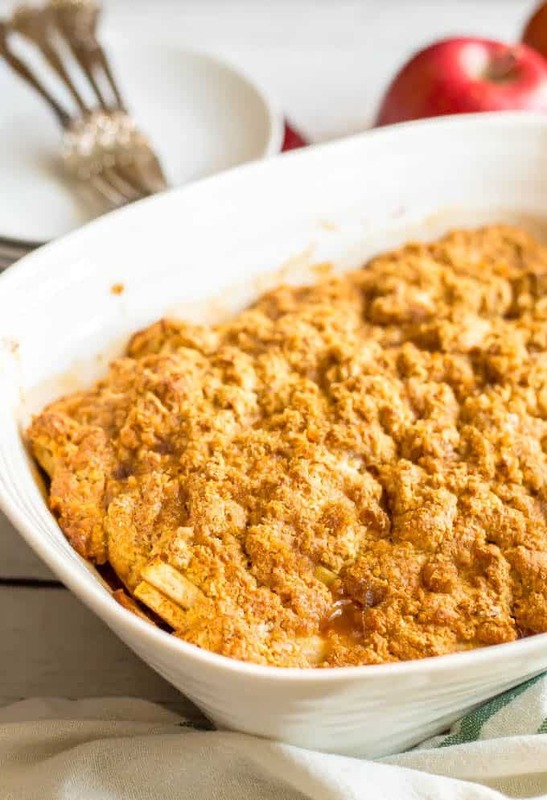 This healthy apple cobbler is full of apple and cinnamon flavors and goes perfect with ice cream for a delicious dessert! 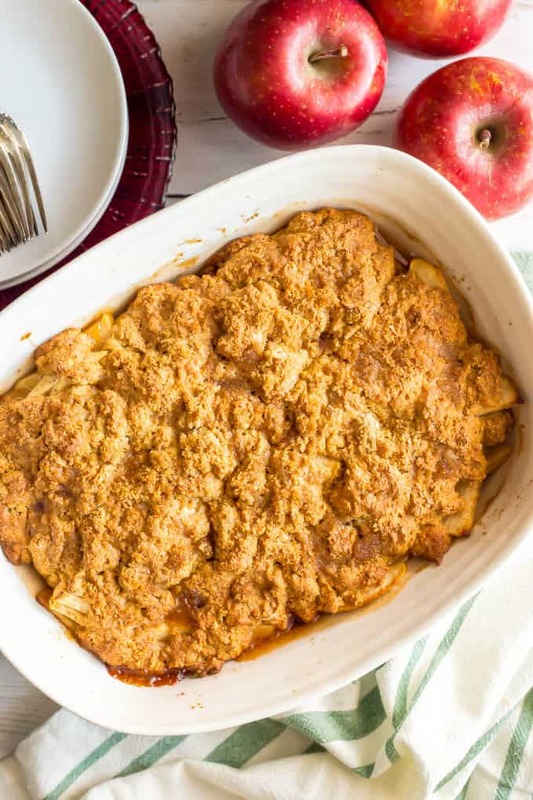 Transfer apples to a 9x13 or 8x12 casserole dish sprayed with cooking spray. Cut in butter using a pastry cutter or two knives, until the mixture resembles small peas. Add milk and stir until just combined. The batter will be thick. 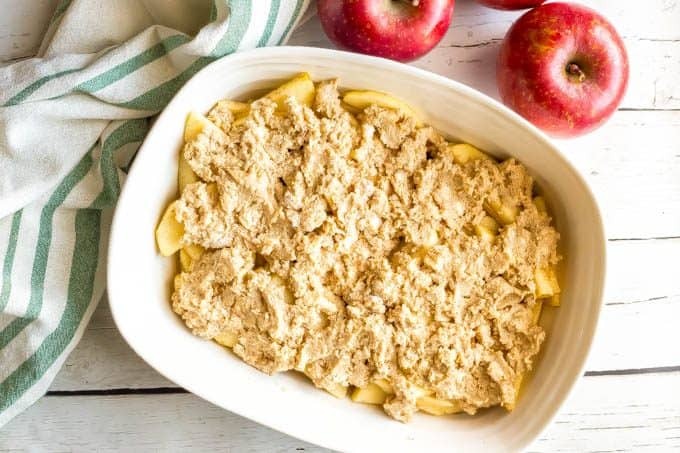 Add the batter mixture in dollops over the apples in the casserole dish and use your fingers to spread it out a little. (It's OK if it's not covering all of the apples - it will continue to spread out while baking.) Sprinkle the brown sugar evenly over the top of the dish. 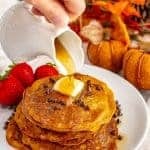 I love all your your recipes! Healthy and delicious. I can’t wait to make the pumpkin recipes.